Now, however, things have changed a bit. A new restaurant has opened in Pittsburgh and they have some raw food items on their menu! 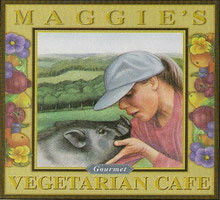 Maggie's Mercantile has been around for quite a few years. Recently they opened a small deli-type restaurant in Oakland, right near the Carnegie Museums that KDcat and I frequently visit. I heard rumors for some time that they were going to be opening up a small restaurant that would be serving raw foods, and I was overjoyed to find out that the rumor was true! They've hired a raw chef, Matt Miller, who's helping Maggie's expand its menu to include all kinds of raw dishes! We stopped by the restaurant this past weekend, to see what it was like and to get a bite to eat (of course!). Jim ordered a vegetable juice, KDcat ordered spinach pie (cooked), and I ordered the nori wrap. The two individuals working at the restaurant were very sweet. However, it's obvious that the restaurant has only recently opened (sometime within the past few weeks, I believe), because they weren't sure about the ingredients and didn't know how to work the juicer (but, I helped them). With a bit more time and experience, it looks like it's going to be a great place to frequent! It's a nice looking restaurant, with a nice feeling to it. Jim enjoyed the juice, KDcat passed the spinach pie to her Daddy to eat (she's picky with spinach pie), and I thought the nori wrap tasted great (the filling tasted a bit cooked, but I trust that the chef is just very talented in preparing delicious raw foods). It would be fantastic if there were more raw food items to choose from on the menu, but even one raw dish that isn't a salad is a huge reason for celebration! I think I'm going to like eating out again. We're going to go back, I'm sure, to see how the restaurant progresses. I hope the place does well and that the raw food menu grows to a point where there seems to be too many choices to make! Maggie's Mercantile is a fresh, raw-friendly restaurant. If you are in the area, think about stopping by to support their efforts to bring fresh foods to the public. Hi WendiDee! I wanted to stop by and "see you." I agree about eating at home. My husband and I used to eat out all the time before I went raw and even now, I'll go with him and do as you by getting a salad. It's not the same at all anymore. I think my husband is even really starting to realize that food at home is much more vibrant and he feels better when he eats what I'm making that's raw. That is exciting that you're going to have a raw option with Maggie's at least. Thanks for stopping by, Penni! It's great that your husband is starting to realize your fresh food at home is so much better than that at the restaurants! If there were a lot of raw restaurants in our town, I think maybe we'd end up eating out a lot more.